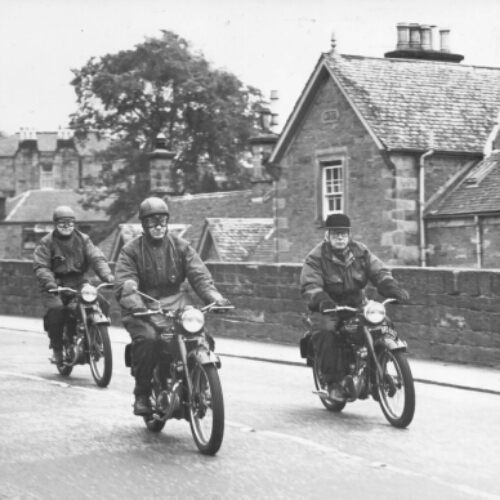 Over 60 years ago on October 5th one Mr Turner and a couple of colleagues took factory Triumph Terriers on a jaunt from Lands End to John O’Groats. Retold in the book “Traveling with Mr Turner”. Of course Edward Turner was the father of The Speed Twin, the Thunderbird and their smaller brethren: the aforementioned Terrier and doughty Tiger Cub. Difficult to deal with, prickly at best, I’m told. Even to his assistant.. his draughtsman [whose name I have promptly forgotten.? Is this the start of..] who actually produced his ideas into designs. He is best remembered for his 1930’s Speed Twin, for being the “New Man” at Ariel and modernising stuff, the same with the Triumph singles when he arrived. I knew Hughie Hancock abit and Percy Tait and others.. he could be terribly rude even to his finest, in the race shop. And according to my sources.. it was all downhill after there. ?